Laboratory work is a hallmark of education in science, engineering and technology-based fields. In the laboratory, students can explore their understanding of theory through putting it into practice, and find motivation in investigating scientific phenomenon, or creating something that actually works. Those of us who have experienced laboratory classes, will probably remember a laboratory class that was particularly memorable or enlightening. However, we can probably also remember hours of tiresome activities that seemed to teach us very little. The design and delivery of laboratory classes and the forms of student assessment used in them, need to be examined critically for their contribution to effective student learning. The original Gold Guide was written for anyone involved in the design or delivery of laboratory classes for science or engineering subjects. 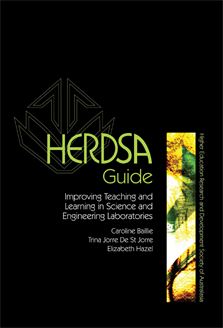 With this new Guide, we attempted to shift laboratory experiences to those which would encourage deeper approaches to learning - more meaningful engaged experiences in which students were able to develop creative critical thinking, alongside the important work of transferring theory into practice. Much work however, has been done since the original Guide was written. Those who have been at the coalface working to support student learning all these years have developed much knowledge and practice which can be drawn upon to improve our understanding of how practical work can enhance student development in the sciences and engineering. This Guide encompasses all the wisdom of yesteryear, much of which has been forgotten, with that which has been discovered since. We hope it will help your students love practice and design as much as we do!